Last November, as my friend Rochelle drove her Oldsmobile Alero down the highway, the engine cut out and left her stranded on the shoulder. After having the car towed to her house, she and her dad tried a few basic repairs to see if they could get the vehicle going. They gave up when those attempts bore no fruit, and the car has sat in the same spot for the past 11 months. When Rochelle told me how tired she was of having her carport occupied by a filthy (and paw print-covered) Alero, and that she just wanted the junker gone, I couldn’t help but volunteer to nurse the poor GM sedan back to health at David Tracy’s Automobile Shelter For Misfit Machines™. (Just look at the poor thing; it deserves a second chance!). So I went over to Rochelle’s house a few times to see if I could get the Olds running well enough to limp it back to my garage. After a bit of tinkering, Rochelle and I noticed that the car ran with starting fluid (albeit briefly), indicating an issue in the fuel delivery system. Oddly, the fuel pump seemed to prime just fine, leading us to side-eye suspiciously at the fuel filter. Replacing it would have required the removal of a fuel vapor canister retaining bolt and a fuel line fitting—both of which were so rusty, I decided I wanted to give them more time to soak in my favorite concoction of penetrating oils. As I had already spent a number of days working on the car, I decided I had reached the socially acceptable limit of how long I could wrench in another person’s driveway, so I asked my friend Michael—who owns a flatbed, and has enabled a lot of my poor automotive decisions—if he would tow the Oldsmobile back to my house. Because I’m a bit of a soup-sandwich, when Michael and I arrived in his Ram 2500, we realized that I had forgotten the key (Rochelle—to whom I am indebted at least 20 hours of wrenching labor—had given me the key when she sold me the car for $1 a few days prior). What this meant was that we had to essentially steal the Oldsmobile out of Rochelle’s driveway. So for those of you wondering how to jack a 2001 Oldsmobile Alero, here’s what you need to know. First step: using all your might, break a window into 1,000 pieces and wake up all the neighbors. Either that, or you can do what we did, and simply open the door. That lever—which attaches to the locked-in-place cable—is held onto the transmission by a single nut, which you can loosen with a giant extension and a socket wrench. From there, take the lever off, screw the nut back on, and tighten until you hear the transmission “click” into neutral. 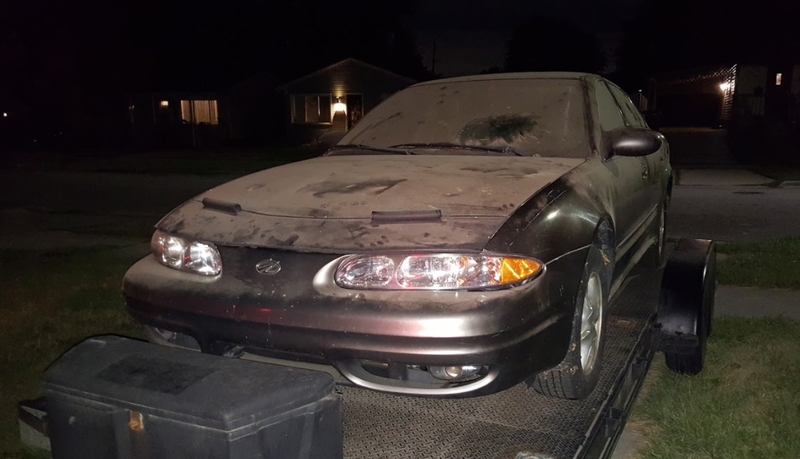 And voila, you now have a totally steal-able Oldsmobile Alero. (Note: please don’t steal cars). Since Michael’s trailer couldn’t make it up Rochelle’s driveway, he and I had to push the car down a decline while Rochelle tried steering onto the two narrow ramps (for some reason, the steering was not locked). In an attempt to help Rochelle navigate (and not run into the back of Michael’s trailer), I forgot to push, and we were—for a brief moment—dead in the water. That was, until some friendly Pontiac, Michigan residents came to our aid, and beast-moded the car up onto the trailer without breaking a sweat. Michael then towed the dead car to my backyard, where we shoved it into the grass. That’s where The $1 Oldsmobile sits at this very moment, hopefully not drawing the judging eyes of my rich neighbor. The good news is that I did spend about 20 minutes under the hood of that Oldsmobile, and—after reading about how to get around GM’s infamous Passlock Security System—I actually got the car running! Granted, it died after about 30 seconds, but there is hope! Our more astute readers might have recognized that, of all people on this earth, I am probably the last one who needs another junker. But, this one is part of a top secret, triple classified, highly encrypted project that I’m working on with one of my loonier coworkers. You can expect to see more of the $1 Oldsmobile soon. More Of The Oldsmobile Content You Demand.